In a representative agent model, the behavior of a social system is described in terms of a single aggregate decision maker. 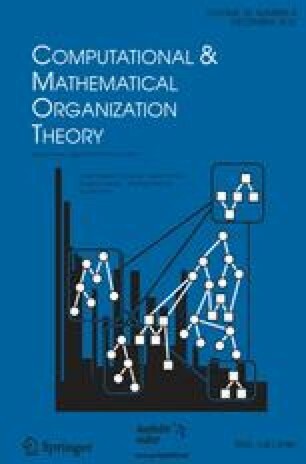 Such models are popular in economic and finance research, largely due to their analytic tractability, but fail to account for real-world agent heterogeneity, and may ignore effects of market microstructure. Agent-based simulation models naturally incorporate agent heterogeneity, and can account for any particular market microstructure; however, such models have gained only limited acceptance by the mainstream economic research community, due to concerns over how much general insight can be gleaned from simulating a particular configuration of agent behaviors. We address such concerns by employing game-theoretic criteria in behavior selection. We present a case study investigating a recent model from the finance literature proposed by Epstein and Schneider (ES), and its ability to explain the classic equity premium puzzle in risky asset pricing. For all market configurations that we examined, ambiguity-averse pricing was played with little or no probability in equilibrium. Moreover, none of the market configurations exhibited significant equity premia. Both our use of strategic equilibrium as a market composition concept, and the actions of our simulated market microstructure contribute to removing any equity premium. These findings underscore the value of checking that results from abstract representative-agent models are supportable in a higher-fidelity model where heterogeneity and strategic interactions are taken into account. This research was supported in part by Grant CCF-0905139 from the U.S. National Science Foundation, and the Army Research Laboratory Collaborative Technology Alliance in Network Science.